This Irish rugby shirt features a traditional two-panel design with elasticized cuffs for a comfort fit and it is enhanced with an embroidered Guinness label chest patch along with the Arthur Guinness signature embroidered on back collar. Please note that this Guinness rugby jersey runs about 1/2 size small and that you should consider ordering one size larger. This black Guinness rugby jersey is a traditional design with concealed rubber safety buttons. 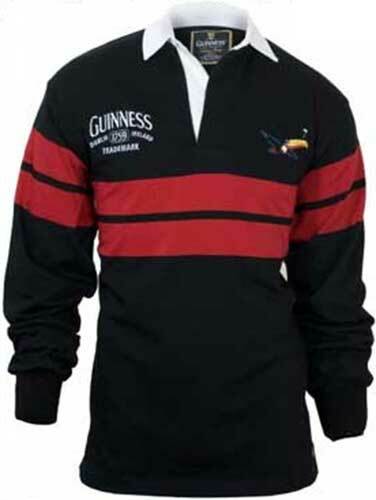 The 100% cotton Guinness rugby shirt is a long sleeve black jersey with embroidered branding. It also features red and white accenting, it is available from The Irish Gift House in limited sizes. This Irish rugby shirt runs about 1/2 size small and you should consider ordering one size larger.